Herpes zoster, which is commonly known as shingles, causes painful blisters near the nerves on one side of your body, but what many people don’t realize is that it can also cause damage to your eyes, including an eye infection, blurry vision, and swollen eyelids. If you haven’t had chickenpox, then you can’t get herpes zoster, but if you have had chickenpox, it is a possibility. Herpes zoster or shingles is, in fact, a virus. Early diagnosis can reduce the risk of complications such as eye infection, blurry vision, and swollen eyelids. In some cases, people only have eye symptoms and no blisters. You can have shingles on the eyelid and around the eye that are very irritating. They cause swelling, redness, and pain. Shingles that involve the eye are called herpes zoster ophthalmicus. When a person is getting over shingles that are on their body, the blisters start to crust over, and the pain and irritation tend to disappear over a period of one to three weeks. When the shingles virus damages a nerve, you can have pain or tingling for months or even years after the actual blister rash has healed. Research suggests that people with weakened immune systems, those who are under stress, and older individuals are at a higher risk of getting shingles. 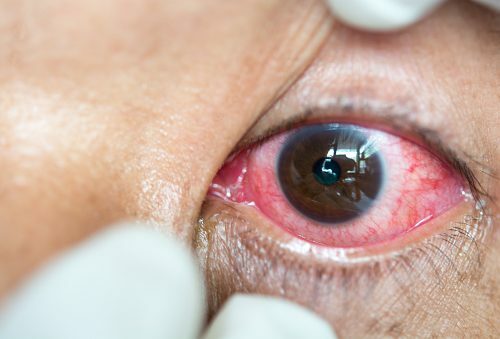 Herpes zoster eye infections seem to be random and not necessarily associated with stress or immune weakness, according to current data, but studies continue on the subject. After the first couple of days, the rash will appear on the side of the body where the initial pain and tingling was felt. The rash will always be on one side of the body or face as the shingles virus travels along the nerve path. This initial rash will become painful blisters a couple of days after and may eventually pop or rupture, leading to slight bleeding. Over time, the blisters will start to crust over and heal. Singles may last on average two to six weeks. As I am sure you can imagine, shingles in the eye is not something you want to experience. It can be terribly uncomfortable. The varicella zoster virus, as it is called, does come with complications, including potential eye difficulties. In about two percent of shingles cases where eyes are involved, there are complications. In some cases, these problems can lead to loss of vision. For example, eye inflammation beginning with fever, headache, decreased vision, pain, and droopy eyelid needs to be addressed. If a person has blisters or lesions near an eye, they should seriously consider seeing an eye specialist. Retinal inflammation can cause a condition called acute retinal necrosis. The retina is located in the back of the eye. It senses light and controls our vision. Retinal inflammation normally starts with blurry vision and pain in one eye. In some people, it later impacts the other eye. If treated quickly, it can be improved. Eye infections associated with shingles are normally detected by signs and symptoms, including erosion on the outer layer of the cornea. An eye doctor diagnoses this during an exam using eye drops containing a yellow dye and a blue light. The erosion linked to shingles usually has a tree-branching pattern to it. An eye doctor will also take a close look at eye tissues. In some cases, a culture will be taken to confirm the diagnosis. Most individuals diagnosed are older than 60 years of age. If a shingles eye infection is neglected for too long, it may have serious consequences, such as going blind. When eye pressure is impacted due to swelling, a pressure-lowering medication may also be suggested. And inflammation may require medications such as steroid treatments. Most shingle eye infections that are on the outer layer of the cornea get better within a few weeks of antiviral treatment. Sometimes, herpes zoster can leave scarring on the cornea, but this is something that can be corrected with surgery. It is also a good idea to prevent the spread of the virus if living with others. During the blister phase, the rash is very infections, to the point where direct contact or indirect contact from towels or commonly used items may be a mode of transmission. Keeping the affected area washed and dressed in clean bandages every day will reduce the likelihood of transmitting the virus. Many people who experience frequent, reoccurring herpes zoster eye infections are prescribed a low-dose antiviral drug on a daily basis. It has been known to reduce recurrences. You do have to have a detailed discussion with your doctor to determine if this is a safe option for you. There is also a shingles vaccine. It is available to people who are 50 years of age or older. The vaccine can help prevent or lessen the symptoms of shingles. It is not a treatment once a person actually has shingles. Always wash your hand after touching the rash. Research continues to come up with ways to get rid of the varicella zoster virus that causes shingles and the eye infections that can accompany the condition. In the meantime, maintaining good overall health, including a strong immune system and lowering stress, may help you keep the nasty virus at bay.